Fully functional and UNLOCKED ready for use with GSM Networks! CDMA and GSM represent a gap you can't cross. This is the reason you can't use AT&T phones on Verizon's network and vice versa. Which Carries are CDMA?. Make: Samsung. Check with the manufacturer for more warranty information. Model: 6586A. Compatible with Verizon 4G LTE network, this tablet can connect to the Internet from practically anywhere—all you need is a data plan (not included). Cellular data: 4G LTE. Storage: 16GB. Carrier compatibility: this tablet is only compatible with Verizon network. 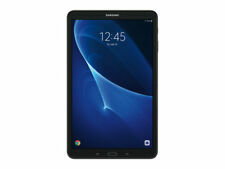 This auction is for a Lot of (3) Samsung Galaxy Tab S SM-T807A 16GB 10.5in WiFi 4G LTE GSM AT&T Gray with charger and cable Functionality - These tablets have been tested by our technical team to be fully functional and the software has been reset to factory settings. Cosmetic Condition – Units are in excellent cosmetic shape and the photos are of the exact units you will receive Testing – all of our used/refurbished tablets go through an extensive list of 20 functional checks. You can feel confident that this tablet will function correctly right out of the box. Note on batteries – Batteries by their nature have a limited lifespan. If the listing shows a battery included, we have verified it will take a charge but cannot guarantee or predict how much useful life it may have left. Locked vs. Unlocked Wireless Devices. CDMA and GSM represent a gap you can't cross. This is the reason you can't use AT&T phones on Verizon's network and vice versa. Which Carries are CDMA?. Which are GSM?. Samsung Galaxy Tab A 8.0 2017 LTE (SM-T385). Optimized for wherever life leads you. Keep tabs of what your young ones are watching. Samsung Galaxy Tab A 8.0 2017 LTE (SM-T385) x 1. 2GB RAM / 16GB ROM. In good condition. 4G LTE capability. 16GB internal storage plus microSD slot. Expand your Galaxy Tab E’s capacity and take your favourite films, music and books with you wherever you go. Wi-Fi GSM 4G AT&T. 4G LTE, Wi-Fi. 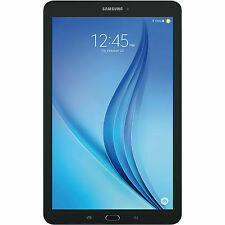 Galaxy Tab E - 8" - 16GB - Wi-Fi 4G LTE Verizon. Stylus Dock. Screen Size. Screen Resolution. Battery Type. 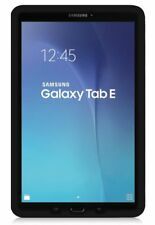 Samsung Galaxy Tab E. Galaxy Tab E.
All handsets are unlocked from AT&T network and will also work as "Wi-Fi only" if cellular plan is not desired. These tablets are in good to excellent condition with little or no scratches on the screen. Samsung Galaxy Tab 4 T337v. This tablet is fully functional including a working touchscreen. USB cable is new non-OEM but has been tested and works normally with the product. This battery passed our limited testing. Tablet in New condition (factory protective film still on screen & back and never been removed) All New Original Accessory. SIM card is included. Compatible with 4G LTE network, this tablet can connect to the Internet from practically anywhere—all you need is a data plan (not included). Cellular data: LTE. Storage: 16GB. Product weight: 1.03lb. Y030 990000244934842 SV. Verizon Cell Phones. Device is in 100% WORKING condition. It has been extensively tested and found to be fully functional. Clean ESN. Battery and Battery door. buy it now. Certain phones will require a sim card or an existing smartphone data plan. Samsung Galaxy Tab E 8" HD 16GB Wi-Fi 4G LTE GSM Unlocked Tablet. Condition is New. Shipped with USPS Priority Mail. WiFi Verizon. We'll do all we can to help. Up for sale is Samsung Galaxy Tab A model 2018, 32GB, Wi-Fi- TLE connect, 8 inch - Black. Brand new condition, just open box to take picture, Tablet never turn on. Due to brand new item, i dont accept return and will ship with USPS Priority Mail within 2 business days, only ship to clear address, WONT ship to any freight forward companies. If you have any questions, just lmk. Thank you. 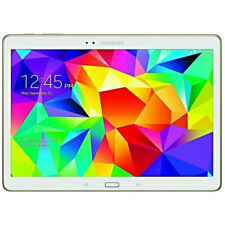 Up for auction is my Samsung Galaxy Tab S4 (T-Mobile) 4G LTE Tablet. It is in perfect condition with not a scratch! Just dont use as much as I thought I would. Included is the S pen and Box and has been reset. Any questions? Feel free to ask. 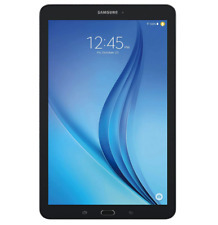 Samsung Galaxy Tab E | 8" HD Display 16GB WiFi 4G LTE | 5MP Camera. Condition is Like new barely used. Shipped with USPS Priority Mail. Trending at $83.03eBay determines this price through a machine learned model of the product's sale prices within the last 90 days. This is NOT a Phone, it is a Tablet. GSM Unlocked for any GSM Network Worldwide. Product Condition: New otherItem which includes accessories.Might show minor blemishes Where applicable, manuals are not be included. 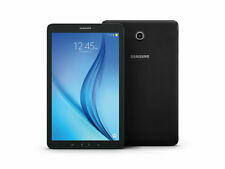 Samsung Galaxy Tab S2 SM-T719 8.0" LTE. This is a Cellular Tablet, Not the Wifi Only Model. You CAN put your GSM SIMcard in and it will operate as a phone. - 4: 3 display format for a great overview The Galaxy Tab S2's 4: 3 format. This tablet is USED and has been FULLY TESTED and reset to factory defaults. All buttons press properly and function as intended. USB Charging Cable. This item is professionally tested and is fully functional. WAS RESET BACK TO FACTORY SETTINGS - ICLOUD AND FIND MY WATCH HAVE BEEN REMOVED AND IS READY FOR THE NEXT USER! EVERYTHING WORKS. Samsung Galaxy Tab 4 SM-T531 16GB, Wi-Fi 4G LTE (Unlocked), 10.1in - Black. Condition is Used. Shipped with USPS Priority Mail. Tablet is in good condition. It supports sim cards (ATT originally but unlocked to any other GSM carriers) The silver trim is peeling a little. Battery was replaced recently. The back cover doesn't close all the way in one corner. Has a screen protector and comes in an original Samsung case that was purchased recently. Everything works. No issues whatsoever. Also included usb charger and cable. Make: Samsung. Check with the manufacturer for more warranty information. Model: 6619A. 3G: HSDPA 850 / 1900 / 2100, 4G: LTE (Bands 1 ,2, 3, 4, 5, 7, 17). Carrier: Verizon. Condition Guide Table for Tablet. We only do RMA in USA. Condition: GOOD. Tablets show signs of use with minor scratches or scuffs. 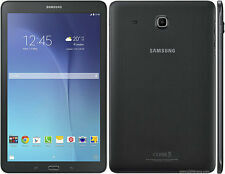 Galaxy Tab E 8" SM-T377V Tablet - 16GB - Verizon - WiFi - 4G LTE - Black. 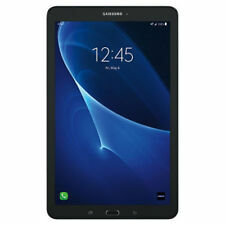 Samsung Galaxy Tab E 8.0" SM-T377V Tablet. get the most out of your Galaxy Tab E 8" with the Samsung app. Plus you’ll have access to music and exclusive content.